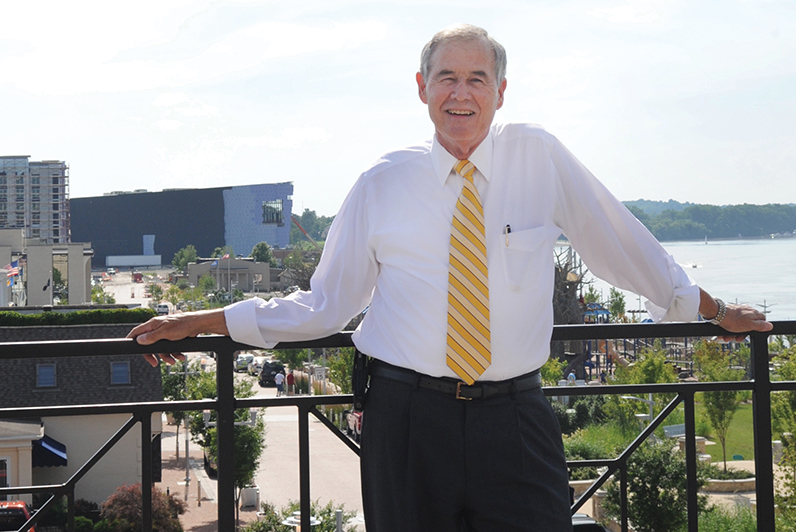 Owensboro Mayor Ron Payne is normally exuberant, but today he is nearly levitating with excitement, the smile on his face brighter than his yellow-striped necktie. 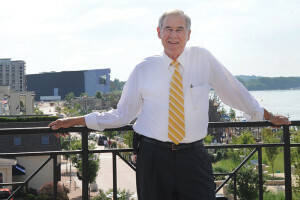 Less than 24 hours earlier he and 20 other community movers and shakers had returned from Denver, where the National Civil League on June 16 named Owensboro an All American City for 2013, one of only 10 towns nationwide to earn the coveted honor. The award – which Payne calls the Nobel Prize for cities – is testimony to the massive change taking place in Kentucky’s fourth-largest city. 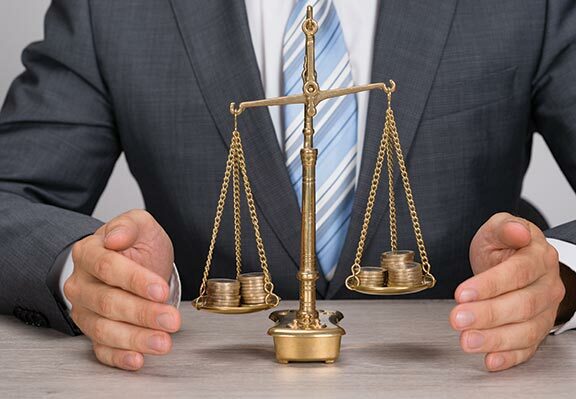 Investments there in the past five years have generated an estimated economic impact of more than $1 billion – much of that in the depth of the nation’s worst recession since the Great Depression. • $424.5 million for the 447-bed Owensboro Health Regional Hospital and medical campus that opened June 1. • $85 million to extend Owensboro’s bypass highway. • $2.1 million for an 8,500-s.f. regional airport terminal expansion. • $31 million in municipal utility projects, including significant drainage improvements. • $21.5 million ($8.7 million public and $13.1 million private) in neighborhood redevelopment near downtown. • $229 million in public-private partnership investment in the downtown riverfront district, including revenue from a special local tax. • $47.4 million for a convention center slated to open late this year. 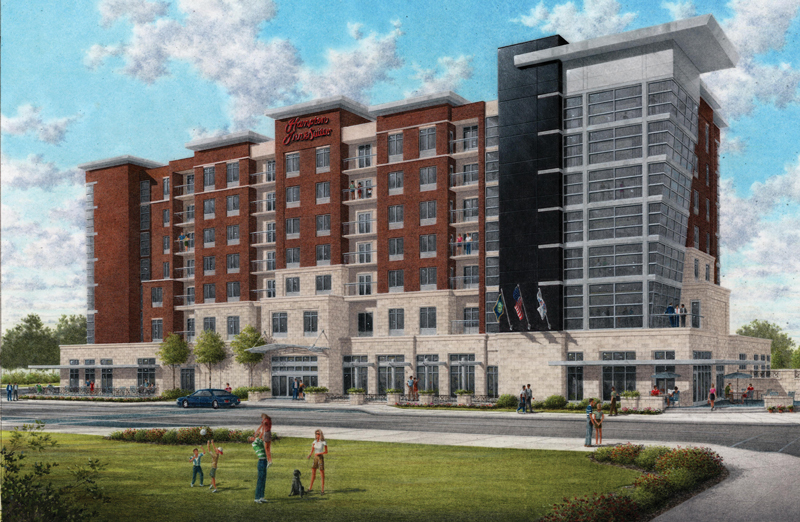 • $20 million for a Hampton Inn & Suites that opens this year also next door to the convention center. • $15.5 million for a Holiday Inn about to begin construction on the other side of the convention center. • Second Street is being transformed into Owensboro’s version of famed Beale Street in Memphis, Tenn., with sidewalk extensions that invite people to stroll the street and eat outdoors. • The Glover Cary Bridge across the Ohio River near the downtown riverfront is being repainted after a $3 million rehab in 2011. Leaders in the city and Daviess County, population 97,234, are pushing for development of a limited-access north-south highway corridor along a route including Owensboro between I-65 in Nashville and I-196 in western Michigan; if that vision is fulfilled, it would become Interstate 67. Additionally, fundraising is almost complete for renovation of a city office building that will become the International Bluegrass Music Center – the city will providing the building and $3 million if the center can raise $7 million. This project is a key element of plans to make Owensboro a magnet for bluegrass music as Nashville, 125 miles south, is for country music. Taken together, the investments represent a move from “the Dark Ages to the Renaissance” for the city, Payne boasts. Little of this would have been possible without a huge political gamble. One of the first items on Mayor Payne’s agenda when he took office in January 2009 was a doubling of the local tax on insurance premiums from 4 to 8 percent to generate $80 million for downtown investment. The 7-to-2 approval vote by city commissioners and the Daviess County Fiscal Court came just one month after Payne took office. Like any proposed tax increase, it was hotly debated, controversial and unpopular – among the seven yes votes, two were defeated and three did not seek re-election in 2010 – at least until others began to see for themselves what Payne and his fellow newly elected commissioners envisioned. The commitment of tax dollars, however, was a powerful statement and prompted the private sector to get on board. Payne and key leaders understood intuitively that the river, which gave Owensboro its past, could also provide it a brighter future. 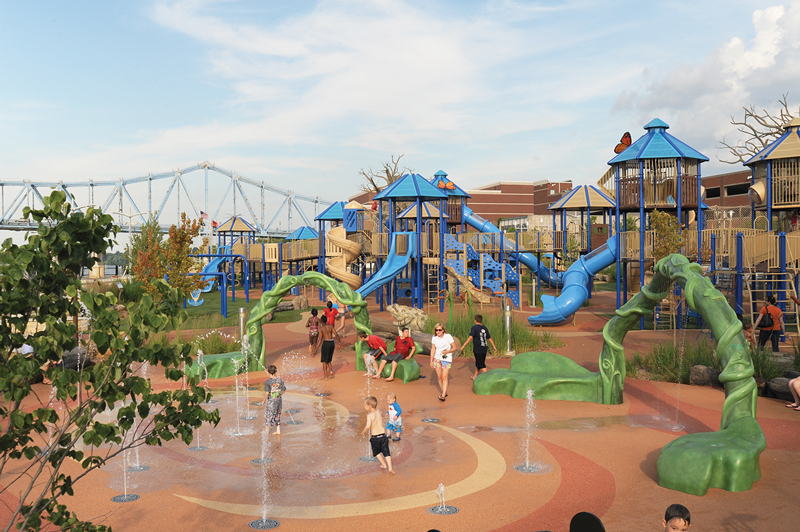 They could imagine what is now Smothers Park and Promenade: a nearly six-acre oasis that fronts the river and includes a sprawling playground, a veterans memorial, promenades, three fountains with water shows every 15 minutes, a cascading waterfall, and seating where residents and visitors can enjoy the powerful Ohio River and its traffic. 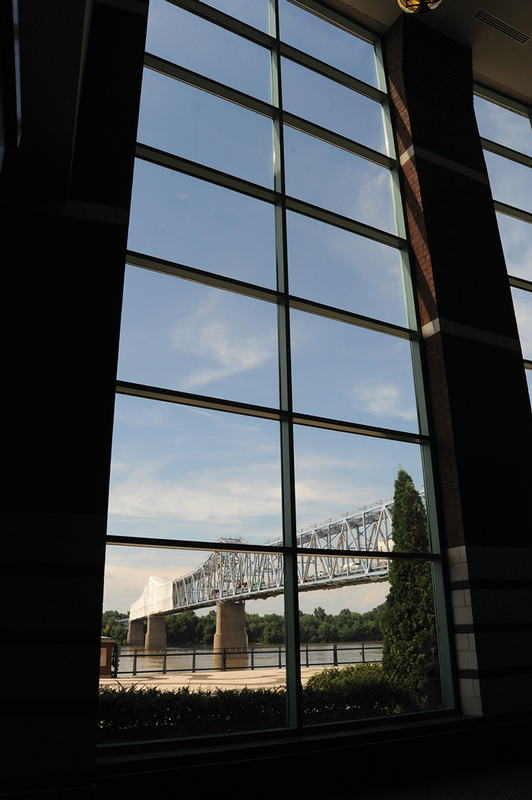 Adjoining one end of this attractive new asset is RiverPark Center, Owensboro’s performing arts center. On the other side are the new 169,000-s.f. convention center, two hotels and businesses. A $40 million riverbank stabilization project, now complete, was designed to stop erosion of Smothers Park and recapture two-and-one-half acres of land that river currents had scoured away in the past. A few blocks over, more businesses are moving into downtown. With a capital investment of $4.2 million and the creation of 25 new jobs, First Security Bank settled in a newly remodeled building. Fifth Third Bank now has an office downtown. Boardwalk Pipeline Partners, a natural gas transmission system operator between the Gulf Coast and the Northeast, built a $12 million, 60,000-s.f. building downtown for its headquarters. As is the trend, many of the renovated historic buildings downtown will have business tenants on the lower level and residential housing above. Boutique shops such as Bella Ragazza, the CupCakery, and C-ing Polkadots are a good fit for this popular urban mix approach to revitalizing downtowns, acknowledgment that for downtowns to truly flourish they need people living there as well as businesses with workers there on weekdays. 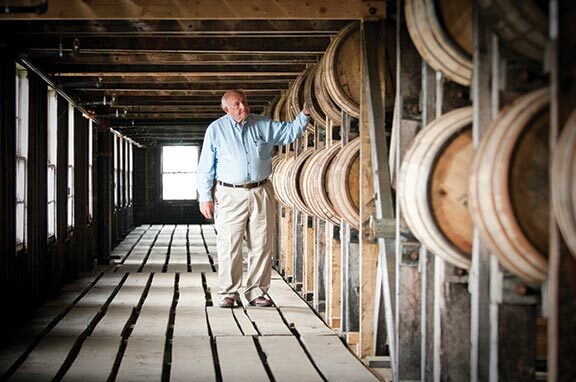 Although it was years in coming, once started, the reinvention of Owensboro has been occurring at a dizzying pace. Daviess County Judge-Executive Al Mattingly is on the executive committee of the Greater Owensboro Economic Development Corp. board of directors and has put county funds into projects including the convention center. Leaders of the city’s economic development agency, The Greater Owensboro Economic Development Corp. (EDC), agreed. They were poised to move, having already brought in experts in citizen engagement who queried residents about their priorities in multiple public forums. The response was clear: Downtown renovation was the top priority to local residents. The EDC brought in urban planners who, using the citizen input, developed the downtown master plan Payne and his leaders were eager to implement when they took office the following year. “Only with that level of citizen engagement could you do something as bold – some said foolhardy at the time – as to raise taxes to pay for these projects right at the onset of the Great Recession,” said Madison Silvert, who became interim president of the Greater Owensboro EDC on July 1. 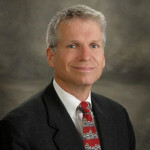 Nick Brake, who had headed economic development since 2006, left to become school superintendent for the Owensboro Public Schools. Another decision had already been made that also set the stage for swift action and growth. Quality of place, said Silvert, is the trump card in attracting business. 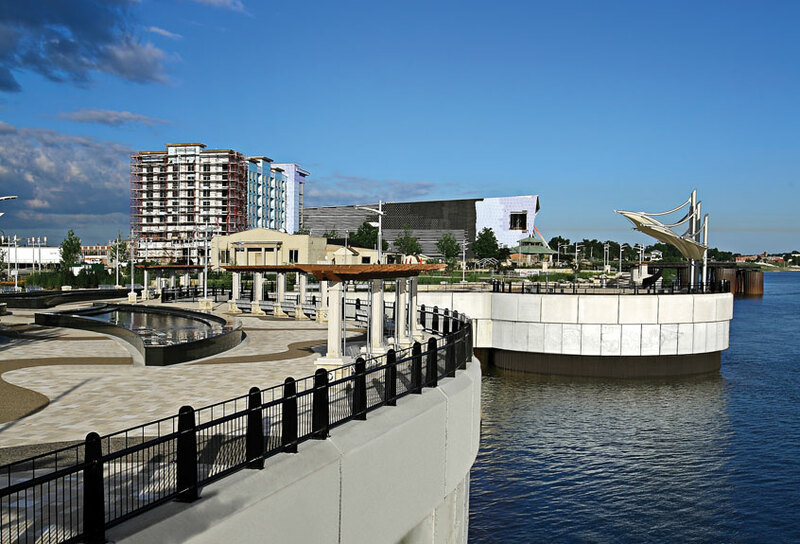 The downtown riverfront makeover has brought Owensboro feature article coverage in The New York Times, The Wall Street Journal and elsewhere. But Owensboro wasn’t taking advantage of its natural assets, Silvert said. The city is already richer in important ways such as jobs. The Daviess County unemployment was 6.7 percent in May, sixth lowest in the commonwealth, whose overall rate is 8.1 percent. 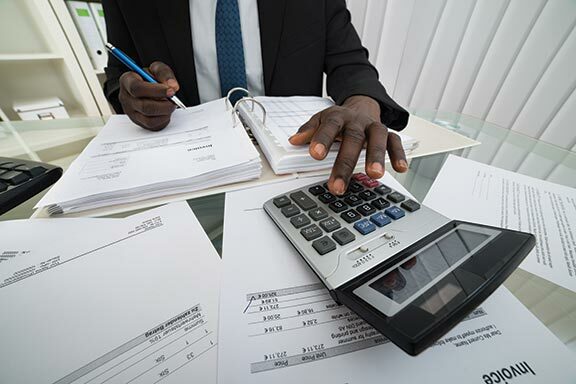 Since 2008, major economic development projects qualifying for incentives under the Kentucky Economic Development Finance Authority have added 2,885 jobs by 26 companies, according to Silvert. Additionally, these companies already have or are investing $220.6 million. The investments show up in other ways. Silvert said payroll employment in Owensboro is well above pre-recession levels, outpacing Kentucky and the nation. Owensboro’s unemployment rate is the lowest in the St. Louis Federal Reserve Region for Kentucky. Finally, housing prices, which did not take a hard hit in Owensboro during the recession, are already 8 percent above pre-recession levels, outpacing other Kentucky MSAs. Owensboro is not putting all its economic eggs in one basket anymore either. The riverfront and downtown will remain crucial, but leaders recognize that they need a variety of businesses from a variety of economic sectors. The Owensboro EDC created an Emerging Ventures Center for Innovation, a local seed capital fund, and a business accelerator with research to support development of high-technology company growth. Owensboro and the entire northwest Kentucky region have become a center for plant biotechnology and renewable energy, attracting 13 new high-tech startups and more than $2 million in venture capital to Owensboro in the past two years. With the recent redevelopment surge, it might be tempting to simply coast for a while. 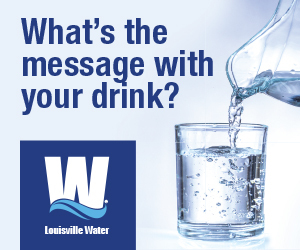 Amy Jackson, president and CEO of the Greater Owensboro Chamber of Commerce, has other thoughts. 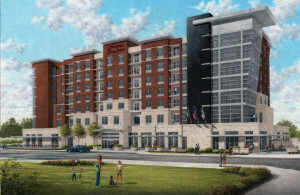 An artist’s rendering of the $20 million Hampton Inn & Suites the Malcolm Bryant Corp. is building adjoining the new Owensboro Convention Center. Back in 1987, when many of the buildings in downtown Owensboro were boarded shut, Malcolm Bryant was a partner in Colby’s Restaurant, then as now located on West Third Street, and then as now thriving. Bryant could now say “I told you so,” if only he had the time. President of the 33-year-old Malcolm Bryant Corp., the developer is too busy overseeing construction of a new $20 million Hampton Inn & Suites on the waterfront, which sits adjacent to the city’s new convention center. 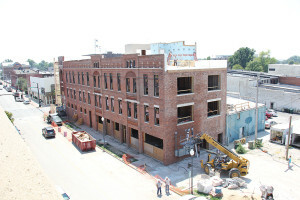 Both buildings are scheduled to open in late 2013. The new hotel – now about 60 percent complete – will be the first new-build LEED certified hotel in Kentucky and will be totally geothermal. It will include eco-friendly features such as car charging stations and cold-water washing as well as amenities such as a full-service steak and seafood restaurant, boutique, and indoor and outdoor swimming pools. Bryant also owns about 1 million s.f. of office and multiuse space in downtown Owensboro – mostly bank and professional office buildings, most boasting Bryant’s trademark of blending historic treasure with modern-day charm.